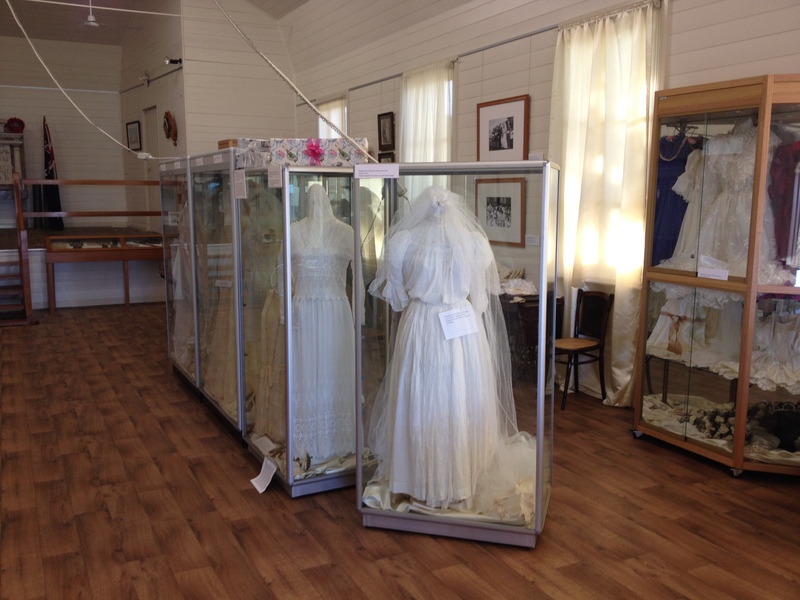 The museum is housed in the old Cardwell Telegraph and Post Office which was built in 1870 and is one of the oldest buildings in North Queensland. It is on the Queensland Heritage Register, the Register of the National Trust and the Register of the National Estate of the Australian Heritage Commission. The building itself was prefabricated in Brisbane and shipped to Cardwell where it was erected on the present site. It is considered to be one of the earliest examples of prefabricated post office buildings, reflecting the need to erect substantial Government buildings in remote settlements where structures were otherwise relatively unsophisticated. Cyclone flags were used to warn about approaching cyclones. Murray Massey a member of the Cardwell and District Historical Society, and long time Cardwell resident spoke to Denise Raleigh who worked on the Telephone Exchange from 1955 to 1959. Denise said there was a yellow ‘alert’ flag and a red ‘warning’ flag flown at the Post Office when cyclones approached Cardwell. The decision on when to raise the flags was made locally by the Postmaster, Mr Collins, who was guided by the barograph that measured the changes in atmospheric pressure that can be sudden and dramatic when a cyclone nears. Murray recalls the face of the barograph was always on public display through a glass panel on the Post Office verandah, and people visited the Post Office to check the barograph to assess the weather outlook. Like Murray, Denise recalls that the alert and warning flags were flown from a flag pole on Victoria Street in the front yard of the Post Office. Murray believes the need to fly a warning flag publicly in the mid-20th century, is highlighted by the fact that few people had landline telephones in that era, long before mobile phones were invented. Denise recalls that there were only 30 lines available on the Cardwell Telephone Exchange switchboard, and only about 22 of them were connected, when she worked there. This means only 22 homes or businesses in Cardwell had a telephone. There was a public phone at the Post Office. Denise says there were lines from the Cardwell exchange through which customers could be connected with exchanges at Carruchan, Tully, Ingham and Townsville, and that calls to Brisbane and beyond had to be routed through Townsville. Denise recalls the following occurrences during cyclone Agnes which, unusually, moved northwards along the east coast, buffeting Proserpine, Bowen and the Burdekin before its eye passed over Townsville around 2.00pm on March 6 1956 and continued northwards, swinging inland near Ingham before weakening. “Mr Collins (Percy Collins) was the Postmaster then and he never called the Telephone Exchange girls by their names: we were all ‘Girlie’ to Mr Collins. ‘I didn’t have to pedal Mr Collins, because the wind pushed me along Victoria Street,’ I replied. I remember though, having to be careful while riding my bicycle, to dodge the metal garbage bins which were flying all around. With guidance from Queensland Museum conservators and the support of Helen Pedley from the Cassowary Coast Regional Council the cyclone flag was removed and rehung to ensure its continued conservation. As with many of the museum development officer jobs, there is a priority to purchase materials locally and to work within a tight budget. The cyclone flag was carefully measured by Helen and the Perspex was pre-ordered from Townsville. Ewen and Jo then purchased all of the rest of the requirements from the local hardware store in Cardwell. Marine ply was chosen as the base for the backing board because of its more stable properties. The ply was then covered with unbleached calico and ironed. A display system was then made using Velcro. Firstly half of the Velcro was machine sewn on to a strip of unbleached calico. This strip was then carefully hand sewn directly onto the flag with the Velcro facing out. The other half of the Velcro was attached to the backing board using a staple gun. This strong yet detachable system allows for good object support and easy removal for cleaning or in case of an approaching cyclone! A simple yet effective spacer was then made up using stainless steel bolts, washers and a electrical conduit joiner. This spacer allows the Perspex to sit away from the cyclone flag and yet still have the protective properties. MDOs Ewen McPhee and Jo Wills recently visited Cardwell to update their Disaster Plan and start planning for their Anzac Centenary Exhibition – Re-Honouring Cardwell. 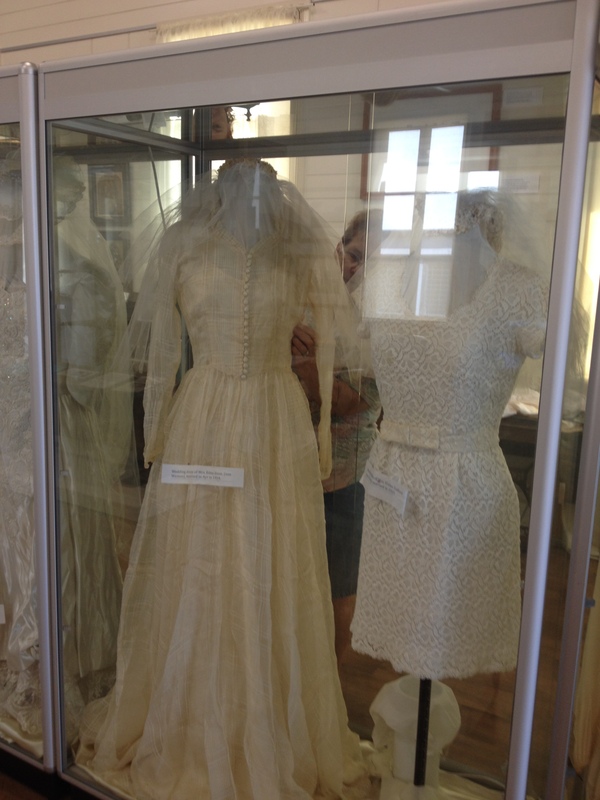 In between visits, the historical society members, led by Stephanie Berger, developed and opened a new exhibition featuring wedding dresses and accouterments over time. 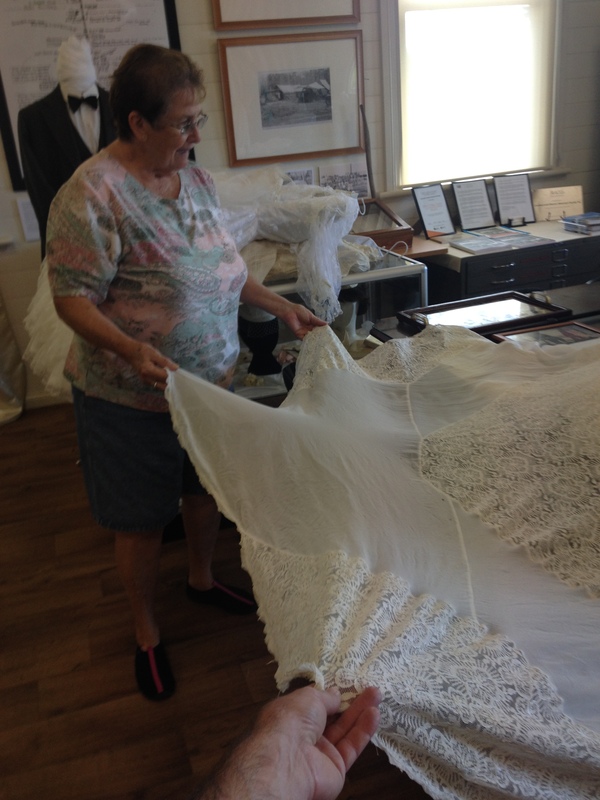 Stephanie, who is a well known dressmaker in north Queensland has also been actively involved in leading the 150 year celebrations for Cardwell and the Cassowary Coast Region through the making of period costumes. 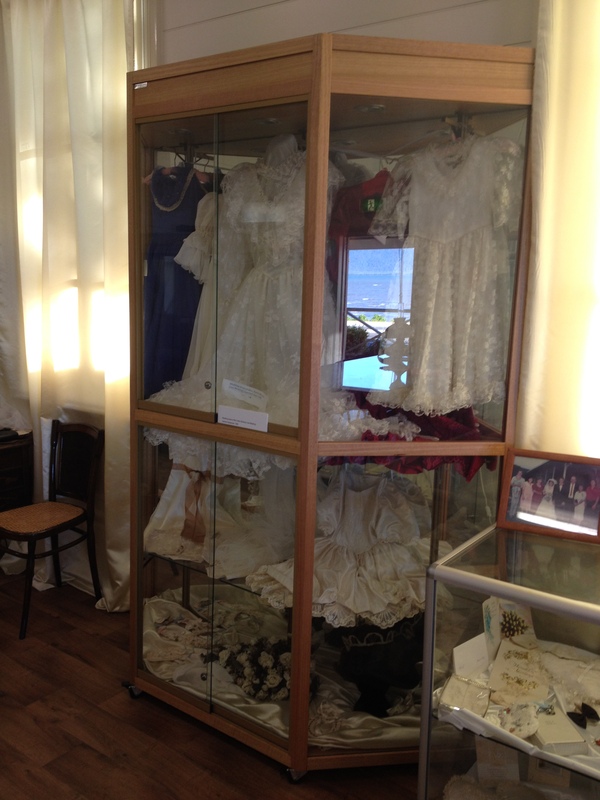 The wedding dresses on display at the Cardwell Museum range from the years of 1892, 1915, 1927, 1947, 1948, 1950s, 1960s, 1970s, 1980s, and 1990s. Dresses in the exhibition include the Hubinger dress from 1892, which is a quite simple skirt and blouse as was the fashion of the time. The dress from 1915 is a much more detailed dress with definite French styling in lace and figured crepe. 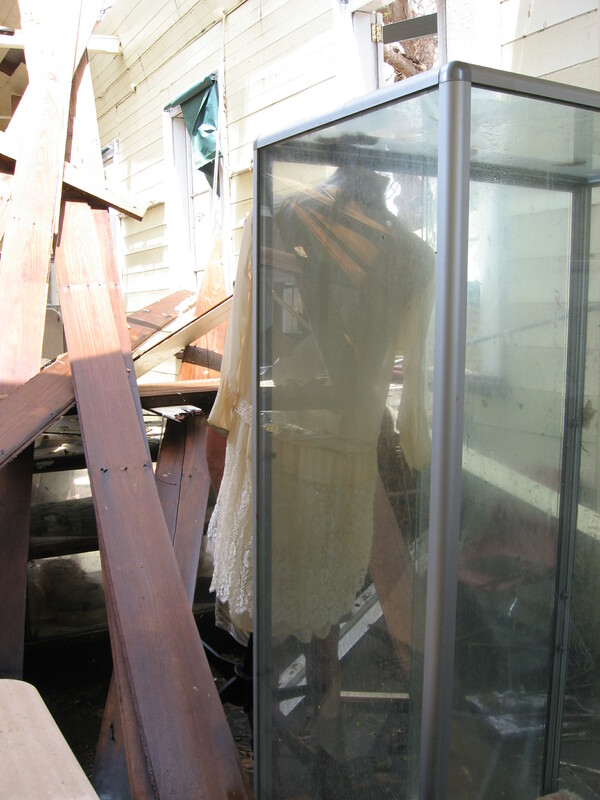 The Hubinger dress from 1927 has been in the Museum since before Cyclone Yasi and was painstakingly salvaged and cared for. The most gorgeous dress in the whole collection in Stephanie’s opinion is the 1947 dress featuring a long train with inserted bands of lace in the skirt, and the bride of 92 yrs told us that the dress cost 100 pounds when it was made in Brisbane. 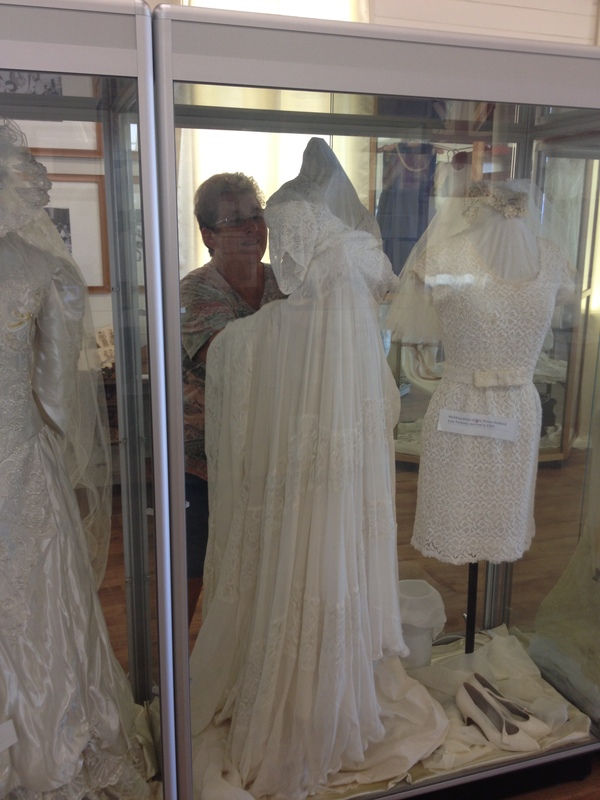 Stephanie Berger arranging the 1947 wedding dress worn by Mrs Von Brennan, married in Brisbane and costing 100 pounds. The 1948 dress is lace. Rations after the war meant that lace didn’t require any coupons where other fabrics did. The dress from the 1950’s is a mini in all over guipere lace, quite tailored and worn with a short veil. As the following years showed the fabrics changed and the dresses became more ornate and the later years all featured beading. For those who are interested in other wedding dress displays, have a look at the Victoria and Albert Museum’s exhibition here. 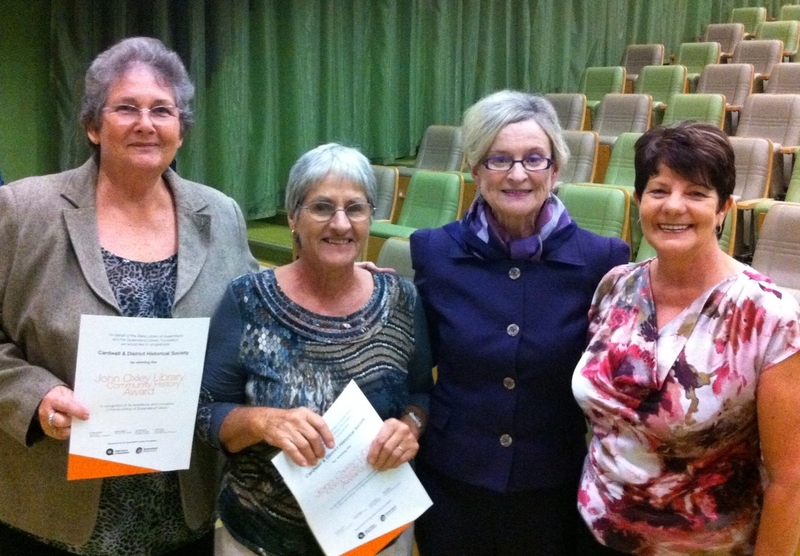 The Cardwell and District Historical Society (CDHS) was recently awarded the John Oxley Library Community History Prize. The Prize recognises excellence and innovation in recording of Queensland history by individuals and community organisations. The CDHS were awarded for their efforts in retrieving their collections in the J.C Hubinger Museum from the debris left by Cyclone Yasi. They were also able to rebuild the local history collection, record oral histories, produce significant publications and plan, construct and move into a new facility. Ewen worked with Jo Wills (MDO Cairns) and Michael Marzik (designer) on Thursday 15 March in Cardwell to install the new hanging system. The Hubinger Hall was handed back to Cassowary Coast Council after a rebuild following cyclone Yasi. 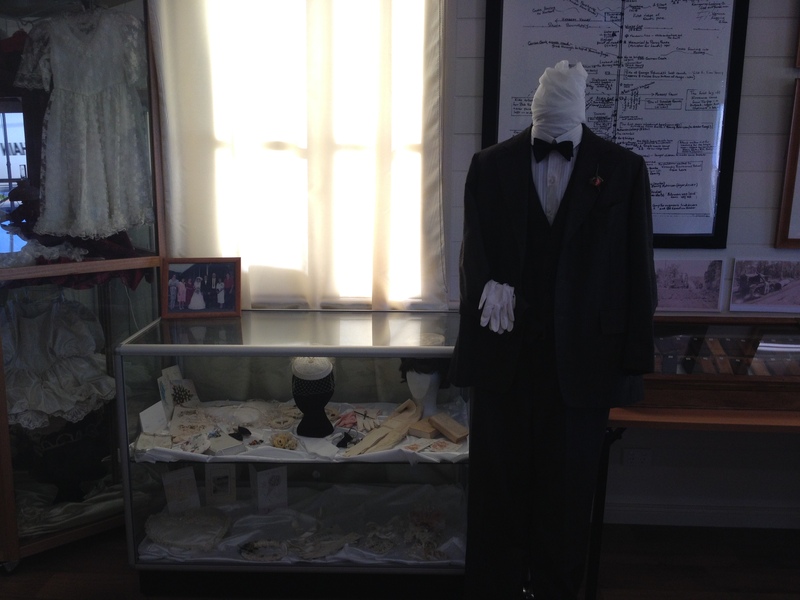 Ewen’s work with the historical society in Cardwell has meant that he was able to plan a new exhibition space for them from the beginning. Last day in January and heading north up to Cardwell, El Arish and Innisfail. 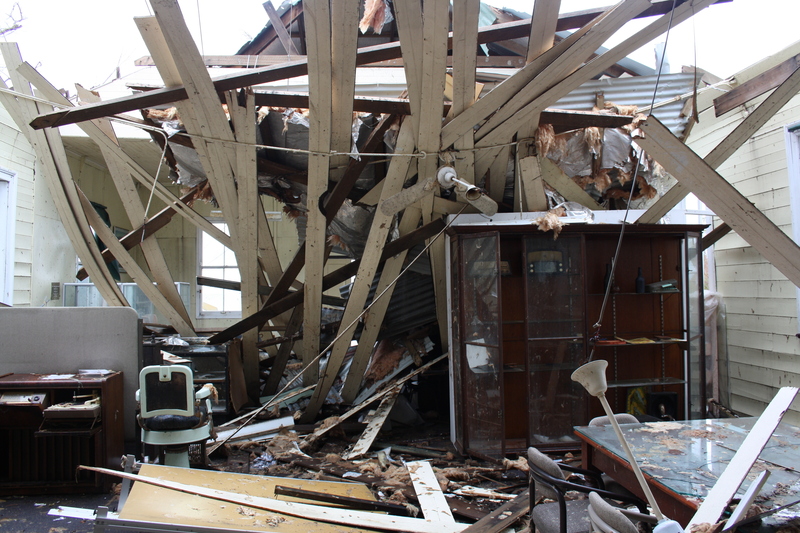 It has been one year since Cyclone Yasi visited north Queensland and caused such widespread damage to these towns and communities. First stop was an 11am on site meeting at the building site of the J.C. Hubinger Museum in Cardwell.